Sam is a creative, fun kid. He is the little sweetheart of my life! These are some of the cute things he did around the house last month. He made use of our under-used craft supplies and bedazzled his Lego train with beads, pom-poms, and pipe cleaners. He gets this pleased expression on his face when he's done something he's proud of. It's really cute and I'm glad I got it on camera! I don't think I'd define this next project as "cute," but it was a creative "science project" that he did after lunch later that same day. Sam and I were shopping at Michael's and he saw a grow-your-own-snake kit that he wanted to try out (he's been really into snakes lately). You're supposed to put the snake in bath water for about five days and it gets bigger and bigger each day. He was excited to watch it grow. We put it back in the tub to see if it would get any longer. The package said it would get really long, like as-long-as-me long. I was pretty skeptical about that but Sam wanted to try. I was right. The snake didn't grow much bigger, so it was kind of a rip-off, but it was fun for Sam so it was worth it. 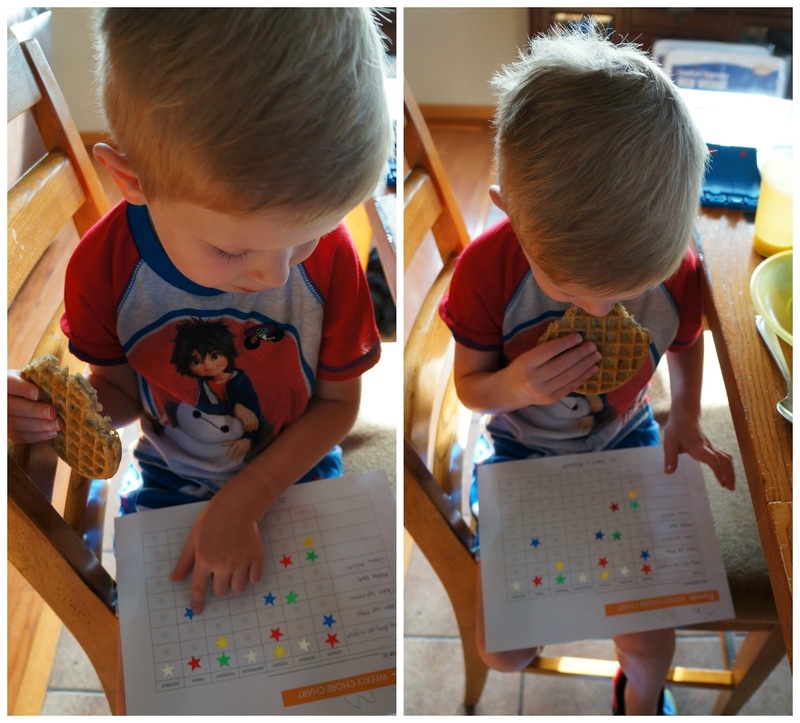 Checking out the status of his rewards/chore chart at breakfast. "How many more stars 'til I earn my reward Mom?" This was a little race car that he made. He drew and colored in the car, cut it out, and then glued on Cheerios wheels, all on his own. It's a change for me to have a child who can do these things easily and who enjoys doing them. John struggled with his fine motor skills at this age and he had to get occupational therapy to help with it. I'm thankful that Sam doesn't face the same problems with drawing, writing, coloring, cutting, and gluing. I wonder where Sam could be hiding? Sam made a giant spiderweb around the whole house with a spool of yarn. It went up and down stairs and all through the rooms on the ground floor. It was pretty impressive. He decided to pack his things for our trip back East this summer. He put them in the spot in the hall where we put our luggage before taking it out to the car. Too bad it was two months early! A picnic lunch in the family room. We sure do love this sweet and fun five-year-old boy of ours!